Musical sonification therapy is a new technique that can reinforce conventional rehabilitation treatments by increasing therapy intensity and engagement through challenging and motivating exercises. Aim of this study is to evaluate the feasibility and validity of the SonicHand protocol, a new training and assessment method for the rehabilitation of hand function. The study was conducted in 15 healthy individuals and 15 stroke patients. The feasibility of implementation of the training protocol was tested in stroke patients only, who practiced a series of exercises concurrently to music sequences produced by specific movements. The assessment protocol evaluated hand motor performance during pronation/supination, wrist horizontal flexion/extension and hand grasp without sonification. From hand position data, 15 quantitative parameters were computed evaluating mean velocity, movement smoothness and angular excursions of hand/fingers. We validated this assessment in terms of its ability to discriminate between patients and healthy subjects, test-retest reliability and concurrent validity with the upper limb section of the Fugl-Meyer scale (FM), the Functional Independence Measure (FIM) and the Box & Block Test (BBT). All patients showed good understanding of the assigned tasks and were able to correctly execute the proposed training protocol, confirming its feasibility. A moderate-to-excellent intraclass correlation coefficient was found in 8/15 computed parameters. Moderate-to-strong correlation was found between the measured parameters and the clinical scales. The SonicHand training protocol is feasible and the assessment protocol showed good to excellent between-group discrimination ability, reliability and concurrent validity, thus enabling the implementation of new personalized and motivating training programs employing sonification for the rehabilitation of hand function. This paper presents a new exoskeleton design for wrist and forearm rehabilitation. The contribution of this study is to offer a methodology which shows how to adapt a serial manipulator that reduces the number of actuators used on exoskeleton design for the rehabilitation. The system offered is a combination of end-effector- and exoskeleton-based devices. The passive exoskeleton is attached to the end effector of the manipulator, which provides motion for the purpose of rehabilitation process. The Denso VP 6-Axis Articulated Robot is used to control motion of the exoskeleton during the rehabilitation process. The exoskeleton is designed to be used for both wrist and forearm motions. The desired moving capabilities of the exoskeleton are flexion–extension (FE) and adduction–abduction (AA) motions for the wrist and pronation–supination (PS) motion for the forearm. The anatomical structure of a human limb is taken as a constraint during the design. The joints on the exoskeleton can be locked or unlocked manually in order to restrict or enable the movements. The parts of the exoskeleton include mechanical stoppers to prevent the excessive motion. One passive degree of freedom (DOF) is added in order to prevent misalignment problems between the axes of FE and AA motions. Kinematic feedback of the experiments is performed by using a wireless motion tracker assembled on the exoskeleton. The results proved that motion transmission from robot to exoskeleton is satisfactorily achieved. Instead of different exoskeletons in which each axis is driven and controlled separately, one serial robot with adaptable passive exoskeletons is adequate to facilitate rehabilitation exercises. Kütük, M. E., Dülger, L. C., and Daş, M. T.: Design of a robot-assisted exoskeleton for passive wrist and forearm rehabilitation, Mech. Sci., 10, 107-118, https://doi.org/10.5194/ms-10-107-2019, 2019. Deficiencies in the upper extremities restrain a person’s ability to go about daily life, consequently limiting one’s independence. Therefore, robots are used to perform task-oriented repetitive movements in order to improve motor recovery, muscle strength and movement coordination. Stroke is one of the primary reasons for a decrease in motor function of the upper limbs of human beings. It restricts the daily, social and household activities of the patients. Therefore, rehabilitation therapy is required to recover some of the movement lost (Bayona et al., 2005; Bonita and Beaglehole, 1988; Cramer and Riley, 2008). This is accomplished by a long-term intensive and repetitive rehabilitation period. Traditional therapies not only require great effort but also require the manual assistance of physiotherapists. The one-to-one contact of the therapists with their patients leaves the therapists exhausted. Moreover, therapists have limited abilities with regard to speed, senses, strength, and repeatability. Robot-aided therapy is a developing part of post-stroke rehabilitation care (Reinkensmeyer et al., 2004). Robotic rehabilitation systems ensure compact therapy which can be applied in repetitive, controllable and accurate manner (Kahn et al., 2006; Marchal-Crespo and Reinkensmeyer, 2009). Robotic devices can provide limitless repeatability for patients thus decreasing the effort that therapists have to make (Kwakkel et al., 2008; Lum et al., 2002). Additionally, patient performance evaluation can easily be monitored and assessed by the therapists to adjust the rest of the required therapy (Celik et al., 2010; Ponomarenko et al., 2014). The types of exercises are grouped into two branches: active and passive exercises. The subjects move their limbs actively and apply torque and/or force in active exercises. Passive exercises are in contrast to active exercises, in which the subjects remain passive during the exercise while an active device moves the limb. Continuous passive motion (CPM) is generated in this way (Maciejasz et al., 2014). There is a broad range of robotic systems presented for upper-extremity rehabilitation. The mechanical structure of the rehabilitation robots can be mainly grouped into two parts: “end-effector-based” and “exoskeletons”. MIT-MANUS (Krebs et al., 1998) and MIME (Lum et al., 2002) are included in the first part. End-effector-type robots cover a large workspace without having the capability to apply torques to specific joints of the arm. Having simpler control structure than exoskeletons is an advantage of end-effector-type devices. The most distal part of the robot is in contact with the patient limb. The segments of the upper extremities can be regarded as a mechanical chain. Therefore, motion in the end effector of the robot will automatically move other segments of the patient. They may cause redundant configurations of the patient’s upper extremities and may risk injury. Exoskeletons are the external structural mechanisms that have joints and links that can collaborate with the human body. They transmit motion exerted by the links to the human joints, thus making them suitable for the human anatomy. Exoskeletons must be able to carry out movements within the natural limitations of a human wrist for an ergonomic design. Mechanical and control issues are more complex than end-effector-type devices. The 5 degrees of freedom (DOF) MAHI (Gupta and O’Malley, 2006), 6 DOF ARMin (Nef et al., 2008) and 7 DOF CADEN-7 (Perry et al., 2007) are some examples of exoskeletons used in upper-extremity rehabilitation. LIMPACT (Otten et al., 2015), MIT-Manus (Krebs et al., 1998) and MIME (Lum et al., 2005) are prime examples of systems designed for assisting upper-limb proximal joints (the shoulder and the elbow). On the other hand, CR-2 Haptic (Khor et al., 2014) has one rotational DOF. There are manual reconfigurations for any specific wrist movement. Systems called Universal Haptic Drive (Oblak et al., 2010), Bi-Manu-Track (Lum et al., 1993) and Supinator Extender (Allington et al., 2011) have 2 DOF. The closest configuration resembling a human wrist and a rehabilitation robot can be employed by a 3 DOF system with three revolute joints. This configuration type enhances the functionality of devices providing rehabilitation services as it allows independence for specific motions of the wrist. RiceWrist (Gupta et al., 2008) and CRAMER (Spencer et al., 2008) use parallel mechanisms for wrist and forearm rehabilitation. RiceWrist-S (Pehlivan et al., 2012) is a 3 DOF exoskeleton system which is the developed version of RiceWrist (Gupta et al., 2008). A three-axis gimbal called WristGimbal (Martinez et al., 2013) offers flexibility to adjust rotation centers of the axes in order to match the wrist center of the patient. A 3 DOF self-aligning exoskeleton given in Beekhuis et al. (2013) compensates for misalignment of the wrist and forearm. Parallelogram linkages are used for this purpose. Nu-Wrist (Omarkulov et al., 2016) is a novel self-aligning 3 DOF system allowing passive adaptation in the wrist joint. This paper presents the design of an exoskeleton for human wrist and forearm rehabilitation. Specific wrist and forearm therapies are performed. An issue with the angular displacement limit of a robot axis was experienced. The solution method obtained by changing the design is given herein. Adapting a 6 DOF Denso robot for wrist and forearm rehabilitation is proposed. The novelty of the study is the use of an exoskeleton driven by a serial robot, which is a method that has not yet been tackled in the literature. The proposed system hybridized the end-effector-type and exoskeleton-type rehabilitation systems in order to utilize advantages and to avoid disadvantages. Precise movement transmission from robot to patient limb can be provided by using an exoskeleton which plays a guide role in the exercises. This adaptation makes the system feasible to apply torques to specific joints of the wrist and allow independent, concurrent and precise movement control. This technique offers flexibility to the users. If the user wants wrist and forearm rehabilitation, a 3-D model of the exoskeleton is designed, manufactured with 3-D printing technology and interfaced with the robot. The exoskeleton may be designed for ankle, shoulder and/or elbow applications. Therefore, a serial robot can be used as a motion provider for different types of rehabilitation. Instead of different exoskeletons having a motor for each axis, the combination of a serial robot and passive exoskeleton is enough to perform the rehabilitation exercises. A human uses the distal parts of his/her arm (i.e., wrist, forearm) in coordination with proximal parts (i.e., elbow, shoulder) in order to carry out movements required in daily life, e.g., wrist and forearm motions such as eating, writing, opening a door, driving an automobile and so on. The wrist joint has got 2 DOF; flexion and extension (FE) and radial–ulnar deviation. Radial–ulnar deviations can also be called adduction and abduction (AA), respectively. Flexion is the bending of the wrist so that the palm approaches the anterior surface of the forearm. The extension is the reverse of flexion. 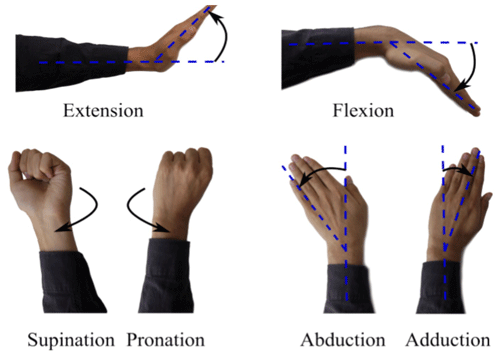 Abduction (radial deviation) is the bending of the wrist towards to the thumb side. The reverse of this motion is called adduction (ulnar deviation). Pronation and supination (PS) are the movements for the forearm. Pronation is applied to a hand such that the palm turns backward or downward. Supination is the rotation of the forearm such that the palm of the hand faces anteriorly to the anatomic position (Omarkulov et al., 2016). These motions are given in Fig. 1. Figure 1DOF of wrist and forearm (Omarkulov et al., 2016). Robots have been demonstrated to assist the rehabilitation of patients with upper or lower limb disabilities. To make exoskeleton robots more friendly and accessible to patients, they need to be lightweight and compact without major performance tradeoffs. Existing upper-limb exoskeleton robots focus on the assistance of the coarse-motion of the upper arm while the fine-motion rehabilitation of the forearm is often ignored. This paper presents a wrist robot with three degrees-of-freedom. Using a geared bearing, slider crank mechanisms, and a spherical mechanism, this robot can provide the complete motion assistance for the forearm. The optimized robot dimensions allow large torque and rotation output while the motors are placed parallel to the forearm. Thus lightweight, compactness, and better inertia properties can be achieved. Linear and rotary series elastic actuators (SEAs) with high torque-to-weight ratios are proposed to accurately measure and control the interaction force and impedance between the robot and the wrist. The resulting 1.5-kg robot can be used alone or easily in combination with other robots to provide various robot-aided upper limb rehabilitation. Wrist pain can be frustrating and inconvenient. It can also make work or basic day-to-day activities, such as using a computer or cooking a meal, more difficult. Exercises can improve mobility and decrease the chance of injury or reinjury. Wrist stretches are easy to do at home or at the office. When done properly, they can benefit a person’s overall wrist and hand health. Anyone experiencing chronic pain or pain with numbness should visit a doctor for a thorough diagnosis. A person should do the exercises below slowly and gently, focusing on stretching and strengthening. If the stretch hurts, stop. Start with your arm up beside your head, with your hand open. Make a fist, keeping your thumb outside of it. Slide your fingers toward your wrist until you feel a stretch. Stretch your arm out in front of you. Slowly, point the fingers down until you feel a stretch. Use the other hand to gently pull the raised hand toward the body. Hold this position for 3–5 seconds. Point the fingers toward the ceiling until you feel a stretch. Use the other hand to gently pull the raised hand toward the body. Hold this position for 3–5 seconds. Sit with your palms together and your elbows on the table in a prayer position. Lower the sides of the hands toward the table until you feel a stretch. Keep your palms together. Hold this position for 5–7 seconds. Hook one elbow under the other and pull both arms towards the center of the torso. You should feel a stretch in your shoulders. Wrap one arm around the other so that the palms are touching. Hold the position for 25 seconds. Switch arms and repeat it on the other side. Bring the pinky and ring fingers together. Separate the middle and index fingers from the ring finger. Repeat the stretch 10 times. Make a fist and hold it in front of you. Stretch your fingers until your hand is flat and open, with the fingers together. Repeat the movements 10 times. Squeeze a sponge or stress ball, making a fist. Start with your hand face down on a table. Gently, point the hand to one side as far as it can go without moving the wrist. Hold it there for 3–5 seconds. Repeat the movement three times on each side. Grab your thumb with the other hand. Gently pull the thumb backward, away from the hand. Repeat it on the other thumb. Stretch the arms in front of you, with the backs of the hands and wrists touching. Imagine an invisible force pulling the fingers further from the body. Feel the stretch. Hold it for 25 seconds. Stretch your fingers outwards as far as they can go, like a fan. Pretend to play a piano. Flip your hands over and play an upside-down piano. Lay your hand flat on a table. Gently pull a finger upward so that it points toward the ceiling. Repeat this on all the other fingers. Bring the middle and ring fingers together. Separate the pinky and index fingers from them. Get into position on your hands and knees, with the fingers pointing toward the body. Slowly lean forward, keeping your elbows straight. Relax, then repeat the stretch. Working with computers, writing, and doing manual labor put strain on the hands and wrists and can cause problems over time, such as tendonitis and carpal tunnel syndrome. Taking frequent breaks and stretching before and while using the hands and wrists can help prevent strain. Improving flexibility and strength gradually can help people avoid wrist and hand injuries. Background. Clinical trials have demonstrated some benefits of electromyogram-triggered/controlled neuromuscular electrical stimulation (EMG-NMES) on motor recovery of upper limb (UL) function in patients with stroke. However, EMG-NMES use in clinical practice is limited due to a lack of evidence supporting its effectiveness. Objective. To perform a systematic review and meta-analysis to determine the effects of EMG-NMES on stroke UL recovery based on each of the International Classification of Functioning, Disability, and Health (ICF) domains. Methods. Database searches identified clinical trials comparing the effect of EMG-NMES versus no treatment or another treatment on stroke upper extremity motor recovery. A meta-analysis was done for outcomes at each ICF domain (Body Structure and Function, Activity and Participation) at posttest (short-term) and follow-up periods. Subgroup analyses were conducted based on stroke chronicity (acute/subacute, chronic phases). Sensitivity analysis was done by removing studies rated as poor or fair quality (PEDro score <6). Results. Twenty-six studies (782 patients) met the inclusion criteria. Fifty percent of them were considered to be of high quality. The meta-analysis showed that EMG-NMES has a robust short-term effect on improving UL motor impairment in the Body Structure and Function domain. No evidence was found in favor of EMG-NMES for the Activity and Participation domain. EMG-NMES had a stronger effect for each ICF domain in chronic (≥3 months) compared to acute/subacute phases. Conclusion. EMG-NMES is effective in the short term in improving UL impairment in individuals with chronic stroke. Control of a exoskeleton with different sensors using a microcontroller and Matlab: This project will be used the exoskeleton for wrist rehabilitation and evaluation designed in the RoboticsLab. This device is actuated with SMA (Shape Memory Alloys) wires and it has two DOF. The objectives of the work will be: to integrate position and pressure sensors into the exoskeleton; to use the information of these sensors to control in position and / or strength the exoskeleton in repetitive tasks for the flexion-extension movement of the wrist; collect data on the execution of the task that could be used by the doctor to evaluate the patient’s progression. Task-specific rehabilitation has emerged as an influential approach to address the specific neurological problems. In particular, the recovery of hand and wrist functions of people suffering from hemiparesis and hemiplegia has appeared as a means of voluntary practices. In this study, a passive rehabilitation device has been designed to offer repetitive, low-cost, portable, easy-to-use human-machine interface for people who have limited hand-wrist mobility, also substantially decrease the therapist’s workload, and provide motivation and objective feedback to users. Therapy-based task-oriented virtual reality games are also accompanied with the proposed rehabilitation device to raise patient’s attention and motivation throught the therapy. A research team at Hong Kong Polytechnic University (PolyU) has developed a robotic arm to facilitate self-help and upper-limb mobile rehabilitation for stroke patients after discharge from hospital. Referred to as a mobile exo-neuro-musculo-skeleton, the robotic arm enables intensive and effective self-help rehabilitation exercise. The lightweight device is said to be the first of its kind to combine exo-skeleton, soft robot and exo-nerve stimulation technologies. It is intended to cater to the increasing need for outpatient rehabilitation service for stroke patients. PolyU Department of Biomedical Engineering researcher Hu Xiaoling said: “We are confident that with our mobile exo-neuro-musculo-skeleton, stroke patients can conduct rehabilitation training anytime and anywhere, turning the training into part of their daily activities. Designed to be flexible and easy-to-use, the robotic arm is compact in size, has fast responses and requires a minimal power supply. It comprises different components for the wrist/hand, elbow, and fingers that can be worn separately or together for various functional training needs. The device can also be connected to a mobile application, where users can manage their training. The exo-skeleton and soft robot components of the device offer external mechanical forces guided by voluntary muscle signals in order to facilitate the desired joint movement for the patients. PolyU improved the rehabilitation by adding its Neuro-muscular Electrical Stimulation (NMES) technology, which allows the robotic arm to contract user’s muscles when electromyography signals are detected. When tested in a clinical trial involving ten stroke patients, the robotic arm is reported to have led to better muscle coordination, wrist and finger functions, and lower muscle spasticity following 20 two-hour training sessions. The researchers plan to collaborate with hospitals and clinics for conducting additional trials. The PolyU-developed robotic arm is the first-of-its-kind integration of exo-skeleton, soft robot and exo-nerve stimulation technologies. It is light in weight, compact in size, fast in response and demands minimal power supply, thus suitable for use in both indoor and outdoor environment. (October 31, 2018) The Hong Kong Polytechnic University (PolyU) recently developed a robotic arm to facilitate self-help and upper-limb mobile rehabilitation for stroke patients. The lightweight device enables the patients to engage in intensive and effective self-help rehabilitation exercise anywhere, anytime after they are discharged from hospital. The robotic arm, called “mobile exo-neuro-musculo-skeleton”, is the first-of-its-kind integration of exo-skeleton, soft robot and exo-nerve stimulation technologies. This work presents a lightweight soft rehabilitation glove that integrates finger and wrist function by developing and applying the Double-DOF soft Pneumatic Bending Actuators (DPBAs). The proposed soft glove can achieve separate as well as coordinated motion exercises of fingers and the wrist, which benefits stroke patients that have complicated hand impairment. It consists of a commercial glove extended by a customized wrist bracer, on which are installed three dorsal DPBAs through fingers (index/middle/ring) and the wrist, two dorsal SPBAs (Single-DOF Pneumatic Bending Actuators) through thumb/pinky, and three palmar SPBAs through wrist. The proposed DPBA has two independent bendable segments to actuate flexion of finger and wrist respectively, whose multi-gait bending conforms with multi-pattern flexion of the biological hand. The SPBAs are used for actuating wrist extension or finger flexion. The proposed wrist bracer is designed as an extension of the glove to install the soft actuators and transfer their motion and force to the wearer’s wrist efficiently as well as minimize unactuated restriction on the hand. To verify its feasibility, we evaluate the range of motion, strength and speed of five subjects’ hands assisted by the glove in six different passive motions. Results show that the proposed glove can provide sufficient assistance for stroke patients in hand rehabilitation exercise. Furthermore, the soft glove has potential in extending the hand functional training from simple exercises such as closing/opening and gripping to complex ones such as weightlifting, writing and screwing/unscrewing.